This is the last rose of the week this week as I will be going back to the plant of the week not because the rose season is over, indeed far from it, the roses in my garden are still flowering away so well, just feel I want to carry on exploring other plants, with the Butterfly count starting, I think it would be great to focus on plants that butterflies love as well, during the survey time. So on with the Rose of the week and I have left one of the best roses until last, buff beauty. This rose brings back memories of childhood as my dad planted one alongside a path to the White House ( no not The White House!) that grew into a fine specimen, pretty disease free and full of these beautiful buff yellow colour flowers, delightly scented and flowered all summer long. Buff Beauty is a hybrid musk rose, a wonderful group of roses are thought to be a cross between rosa multiflora, chinensis and moschata and the hybrid teas from early 20th century. These crosses were started by the Rev Joseph Pemperton at his home, the round house, Havering atte bower, Romford, Essex, a house he was both born (1852)and died (1926). He wanted to bred roses like he remembered from his childhood visits to his grandmas houses, rose that not only looked beautiful but also smelt wonderful! And he succeeded with this wonderful range of plants. We know one of the parents and that’s William Allen Richardson, (a beautiful yellow noisette) sadly not the other. 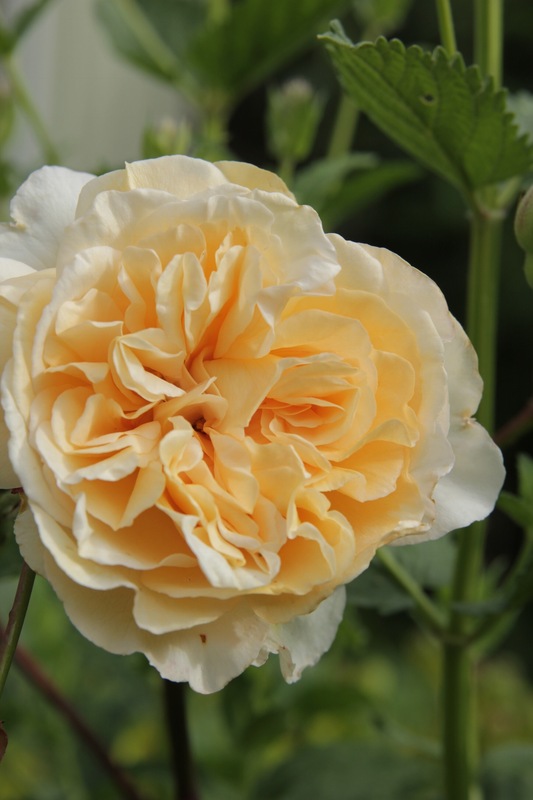 But there’s also a little confusion about whether he did bred the rose, it was introduced by Ann Bentall, in 1936. Ann was the daughter of Pemerton’s head gardener and it is thought she introduced it from his garden. Others have said she wanted to carry on his rose breeding programme and bred this rose and another. My feeling is that it’s the first version that is true, looks so much like his type of breeding, I may aso be incorrect. No matter where it came from, its a great great garden plant, I have used it as a small climber, shrub and a bush rose to great effect, as a bush I prune it down to 300mm in the spring and then it responds with 600mm lengths of growth. It will make about 1.5-1.75m in height as a climber and it works so well with underplanting of blues, as I have said it’s pretty disease free and will grow away quite happy on most soils as long as it well fed. It can be brought from most of the main rose dealers like David Austin roses, Peter Beales and Trevor White Roses.